Lovely bungalow apartment with really exceptional outside space allowing wonderful sun traps throughout the day and all year long. It has been furnished by the owner who has opted for quality rather than economy and guests will not be disappointed. A pretty front garden stocked with bougainvillea, jasmine, hibiscus and orange trees welcomes you. At the rear is a generous terrace with built in barbeque with stairs leading up to the huge rooftop solarium with dinning area. The design of this property is very unusual and rarely available. It appears from the front to be a semi-bungalow with front garden parking & entry at ground level. It is not until you go though the rear door & onto the large terrace that you see the natural terrain has allowed this apartment complex to be built in very attractive 'steps and stairs' on the Vista Golf urbanisation. A very special property for someone looking for short term luxury or a very comfortable long term rental, also has a telephone & internet option via the cable TV system. Comprises: generous well appointed lounge, fully equipped kitchen, 2 spacious double bedrooms, modern, family bathroom. Sun terrace with built in BBQ & a large upper solarium allowing sun all year round. Private south east facing front garden. Parking. Internet, Air Conditioning, Cable TV. Gorgeous shared pool just a few doors along. The charming master bedroom offers a haven to relax. The opulent design comprises: super-king size bed which can be split into twin beds if required, in-built wardrobe. The stylish and bright second bedroom has 2 single beds plus a pull out bed below which is suitable for a small child. Please note that when this third bed is set up, space in the room can be tight! Good sized modern, fully tiled, family bathroom comprising bath with overhead shower, wc and wash hand basin. The kitchen is fully equipped with oven and hob, fridge/freezer, microwave oven and even a dishwasher. Other equipment includes a toaster, kettle, coffee machine, iron and ironing board and clothes airer. All the necessary kitchen and household equipment is provided. The living area provides comfort and plenty of seating with gorgeous and spacious chaise sofa. The sideboard houses the flat screen TV, cable UK/European TV package, WiFi router, DVD player and portable stereo. Also an oval extendable dining table with 4 comfortable chairs (plus 4 more). All linen is provided. Cleaning is provided between each arrival (see charges). Hob/stove, oven. fridge/freezer. coffee machine, microwave . dishwasher, washing machine, iron/ironing board, cable TV , WiFi internet access, new air conditioning, ceiling fans, barbecue, private garden, on street parking, shared pool . There are 2 units, one in each bedroom. Please note these are on timers to avoid them running whilst unattended. Short term or long term rental. Luxury and style is what's on offer in this beautifully appointed bungalow-apartment. As this is the owners holiday home it is furnished to an extremely high standard and is offered as lovely family accommodation with swimming floats, games etc. for use of guests. The apartment has aircon, ceiling and standard fans. Because of its unique position it has both front and back doors (like a bungalow) and plenty of windows, so light breezes flow easily through. For winter warmth, there are plenty of radiators and the air conditioning (on hot) option. The owners would expect guests to take care of this property and it contents. This property is accessed at ground floor level with 3 steps leading to the front door. The outside space is also very impressive with a beautiful front garden scented with jasmine, orange tree and bougainvillea and off road parking and a large rear terrace with built in barbecue. Up a flight of external stairs and you will find a private large solarium measuring approximately 7 x 12m with dining area which attracts the sun all year round. Beautiful landscaped shared pool just a few doors down. 1. A cleaning and laundry fee of 60 Euros is charged by agents and should be paid directly to them on departure. If bringing a pet, please add 10 Euros to this fee. Two units, one in each bedroom (on timers to avoid accidental use when unattended). Electric radiators and air conditioning. Bed linen, towels (not beach), dish towels etc. The living area provides comfort and plenty of seating with gorgeous and spacious chaise sofa. The sideboard houses modern flat screen TV, cable UK/ European TV package, DVD player, WiFi adapter. Fully equipped modern kitchen with oven and hob, fridge/freezer, microwave oven and even a dishwasher. Other equipment includes a toaster, kettle, iron and ironing board and clothes airer. Flat screen with HDMI inputs suitable for laptops, FireStick and Chromecast devices. Villamartin - 5 mins Real Club de Golf de Campoamor - 5 mins Las Ramblas - 5 mins La Finca - 20 mins And another 5 lovely courses within 30 minutes drive. Lovely pool a few doors down. Airport transfers available Available for hire locally: - Golf Clubs (left and right handed) - Bikes - Prams - Child Car Seats and many other items can be hired from our local supplier, if desired. Thank you for your review. We're so delighted you enjoyed your visit. Gorgeous 2 bedroom luxurious penthouse bungalow apartment. Air conditioning, Internet access & cable TV. Front garden, private rear terrace with built in barbecue AND huge private upper sun roof with al fresco dining area. 3 golf courses within 5 minutes drive. Playa Flamenca and La Zenia beaches 10 minutes drive. Shops, banks, restaurants and bars within walking distance. 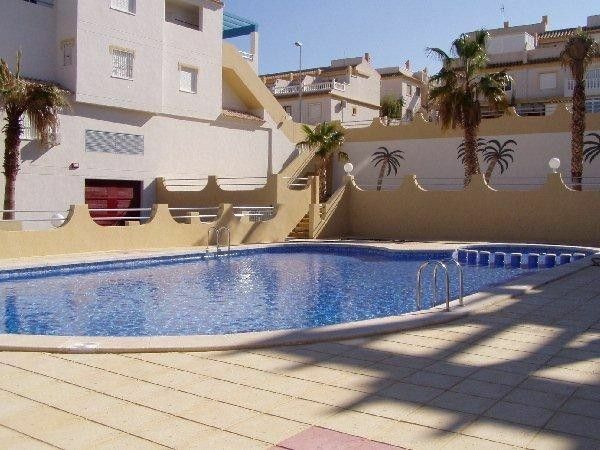 Ideal location to visit Aquopolis water park, Torrevieja marina and salt lakes. Murcia airport 27km. Alicante airport 44km. The Costa Blanca of Spain offers one of the best and most extensive ranges of tourist amenities in Spain. It's excellent climate, blue flag beaches, championship golf courses and cultural richness offers something for everyone to enjoy. The Costa Blanca attractions have been further enhanced by the opening of Terra Mitica near Benidorm, one of the most modern and attractive theme parks in Europe. The Costa Blanca climate is ideal for year round golf and other sports, including tennis, swimming, sailing, water skiing, riding, go-karts, bowling greens and even hot air ballooning. In the evenings there is plenty of night-life to choose from, whether it’s a quite meal in a delightful coastal restaurant or a memorable evening of entertainment. The southern Costa Blanca is mostly flat with fine sandy beaches, palm trees and salt lakes. The south is much drier and more typical of what a person who had never visited Spain would expect to see. It has something for everyone from tiny rural inland villages to cosmopolitan tourist resorts on the coast such as Benidorm. Alicante is a large vibrant town with a large marina and major department stores such as El Corte Ingles, where you can purchase designer clothes etc. Local activities - if the family would like a change from playing by the pool or on the beach why not visit the Aquopolis water park in Torrevieja (open summer months), safari park (near Santa Pola), caves (at Canelobre) or the funfair by Torrevieja marina throughout the summer. Aquapolis water park is a wonderful day out for all the family; with rapids, kamikaze and zig zag water slides, wave pool, swimming pools and infants pool. Jacuzzi, mini golf, restaurant, cafeteria and lots more. Alternatively, why on take a trip to the beautiful, unspoilt, Isla Tabarca from Torrevieja marina or a coast line boat trip. You can fish, or jet ski or go riding at the many riding stables around. There is also ten-pin bowling and even quad biking and go-karting. Villamartin is the most established of the 3 local courses and is the one which the property is closest to. It's a Championship course and was host to the 1994 Mediterranean Open. Clever use of natural contours, an abundance of fairway olive trees and well-placed bunkers makes it a challenging course for players of all abilities. The par 3 ninth with a tee shot over a lake is as pretty as a picture. Las Ramblas is designed by Jose Gancedo. This stunning course is the shortest of the courses but without doubt the most challenging, demanding accuracy and thought at each hole. High tees, narrow fairways and ravines feature strongly on this memorable course. Campoamor is set in two valleys with magnificent views. The front nine are fairly open, but fast well protected greens are just waiting to catch the unwary. The back nine holes are an altogether more demanding proposition as they wind through steep sided hills providing very enjoyable golf. Another 5 courses within 30 mins. Recently opened is the spectacular Zenia Boulevard, the largest Shopping Mall in the Alicante Province with over 150 shops, numerous restaurants, bowling and a casino. Just minutes away from the apartment, this is well worth a visit to pick up some novel items, dine under the stars or just browse.